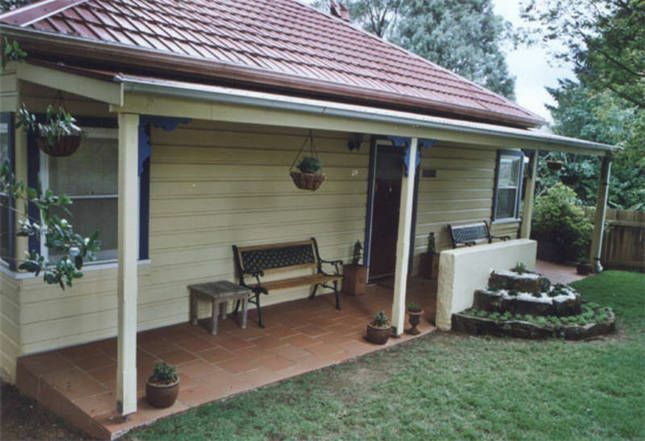 Arcadia is a beautiful 2 to 3 bedroom weatherboard cottage located in a leafy pocket of Katoomba just moments walk to Katoomba Cascades, Katoomba Falls, the Scenic Railway and Skyway, numerous bushwalks, and stunning views to the 3 Sisters. Tastefully furnished throughout, Arcadia offers the ideal base for couples or small groups to explore the Blue Mountains by day and relax in comfort during the evenings. Arcadia has plenty of entertaining areas including a large north-facing rear deck with BBQ, a lounge room with gas-log fire and TV, and a formal dining room. It also has a well equipped kitchen, 2 newly refurbished bathrooms, and full laundry facilities. The rate is dependent on the number of people staying and the number of bedrooms required, becoming cheaper per night and per person the more nights stayed. 2018 rates for non-holiday / special event periods are given below. - a short walk to Echo Point and the 3 Sisters. Turn off the Great Western Highway into Katoomba town centre. Follow the main street, Katoomba St, down past the shops and down the hill towards Echo Point. When the hill flattens out before you get to Echo Point, turn right down Katoomba Falls Rd and head towards the caravan park. Drive past the caravan park and the sign for the Scenic Railway. Continue along until the road becomes Kamillaroi Rd. Look out on the right hand side for Arcadia (no. 31) just before the laneway leading to Katoomba golf course. - catch the shuttle bus, getting off at the caravan park, and walking 5 minutes to the cottage.